Under the patronage of His Highness the Prime Minister Sheikh Jaber Al-Mubarak Al-Sabah and in cooperation with the Central Agency for Information Technology (CAIT), the 6th E-Government Forum (EGOV6) kicked off on Tuesday under the motto ‘Managing Transformation Towards Digitalization’ in the Al-Baraka Ballroom of Crowne Plaza hotel. The forum focused on managing change during the digital transformation journey. On the sidelines of the forum, Deputy Prime Minister and Minister of State for Cabinet Affairs Anas Khaled Al-Saleh said raising the level of digital services in Kuwait is a big concern of the government, adding that the aim of upgrading electronic services is to confront corruption through e-services that remove the human element in the completion of any transaction. Saleh, who heads the board of CAIT, said that Minister of Commerce and Industry Khaled Al-Roudhan, who heads the committee concerned with upgrading the automation of government services, presented a report at the meeting of the Council of Ministers. He pointed out that after the presentation by Roudhan, the economic committee of the Council of Ministers was instructed to review government agencies that need support and which were late in providing their services electronically to find out the causes of delays and resolve obstacles to enable these agencies to raise the level of their services. During his opening speech, Engineer Qussai Al-Shatti, the Acting General Manager of CAIT, said electronic services are a regular product of e-government programs implemented by Kuwait in order to improve government services provided to citizens and residents, adding that the e-government project and electronic services are receiving attention from the political leadership, and the prime minister specifically. 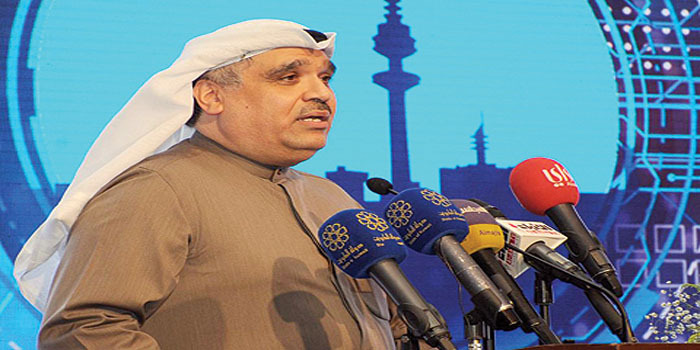 Yousef Al-Marzouq, General Manager of Nouf EXPO, noted that the slogan of the E-Government Forum this year – ‘Managing Transformation Towards Digitalization’ – is one of the basic necessities of success for any work done on a permanent basis, whether related to information technology or others. “The good management of change is the guarantee to implement work plans efficiently and deal well with the constant changes that we are subjected to, along with our ability to make the right decisions in a timely manner and contribute to the success of institutions to achieve their goals and avoid pitfalls during their career,” he pointed out. “While we are fully aware of the administrative and technical complexity of the e-government program and integrated and intelligent government services, we are confident that the Central Information Technology Agency and other information centers of other government entities are capable of developing their policies and systems so that they can manage the variables that surround them to contribute to the success of their national mission of moving government services in Kuwait to the ranks of developed countries and building an information society,” Marzouq added. NoufEXPO, in collaboration with CAIT, is holding the sixth E-Government Forum – Managing Change Towards Digitization from Dec 4-6, 2018. The forum focuses on change management practices that need to be implemented in order to boost the e-government program implementation and make the best use of all available resources along the way. The forum is accompanied by an exhibition where many government organizations in Kuwait are presenting their various projects and e-services. Several companies and institutions are participating in the forum and presenting various solutions for ministries and government institutions in order to help achieve the desired e-government goals including securing data and government systems.